Learn how to achieve more the number of pages on your toner cartridge. When purchasing a laser printer there is the need of obtaining the printing quality it is offered in the package, normally the toner used for micro-business is rated for about 2,000 pages this figure varies depending on the type of toner you use. A toner can always give more, there is a way to set the printer so it can print 20% more pages that it usually does, you have already seen how to print in speedy deletion from a printer with cartridges, what we will do next is something similar but with a laser printer, we will try to make it easy to understand how to print a little bit lighter with a laser printer but getting more pages per toner cartridge. It will be a little difficult to explain this so it can be applied to all HP printers since no all of them have the same settings and the same options, we will try to be as universal as possible to include as many models as we can. Go to your printer settings, to get there you have to go first to printing devices or printer and faxes option, now you will see the icons of all the printers installed, right click on the printer you need to set for toner saving. Click on properties if using Windows XP it will be the last option from top to the bottom and if you are using Windows 7 or later it will be options number four from top to the bottom. 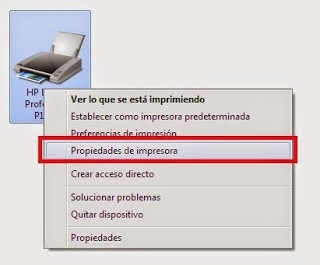 A new window will be displayed where you will find the entire setting of your printer, it goes from the orientation of the pages to the printer sharing, but you will look for in the tabs at the top of the window the one that says device settings, it is in this case, what is consider normal in this type of relation. 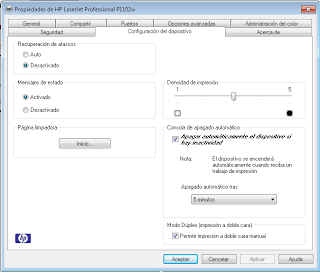 In this case you are using a P1102W HP LaserJet, of course you do not use the same printer but it is related, as we said at the beginning of the post all HP LaserJet printers’ menus are alike you just have to use a little creativity. When you find the tab with the device settings label or a box with options related to configuration and normally to printing. In this point you will find the printing Density option, as we said before, it does not have to be the same in your printer since not all printers have the same menu, it can varies but it is this way how you can identify when to set your laser printer to save an important amount in the toner cartridge. Set the pages to be a little bit lighter, if you are using a new original toner you can set the pointer so the pages come out lighter, the new original toner cartridges gives better quality and withstand the pages to be set to be lighter. If you are using a second hand and refilled toner it is not convenient to use this mechanism to save toner, with time toners lose their capacity to print completely black pages because of cylinder wear, with the fact of refilling the cylinder you are already saving money. This can also help to solve the problem in case your printer is printing too light, by default printers always indicate the middle, but you have to place the pages clarity pointer where you consider it must be. In case you need help with a special case related to this please contact us.